I love deviled eggs but they can be a bit boring. So I decided to try to divise a recipe for a deviled egg that was just a bit more interesting than the classic paprika top variety. Which lead me to create my BLT Deviled Eggs. These guys have already have been deemed a favorite by my family and hopefully soon by you too. We thought it would be beneficial this month to go over some commonly asked customer questions, here our our responses. Do I have to thaw my chicken before using slow cooker mixes? -Our slow cooker mixes are tested to be made from “freezer to crock pot”? Just like you we live a very busy schedule and don’t always remember to defrost! Simply add your frozen meat to the crock pot and follow the directions on your product package, slow cook and enjoy! Are their product ingredients listed anywhere? -We are upgrading our software and are pleased to announce full product ingredient lists will be coming soon. Are your products “all natural”? – There are no current regulations on what is considered to officially be “all natural”, so we avoid using this claim. We believe that what you feed your families should be based on your personal guidelines and that is why we have decide to post our ingredients lists, so you can determine for your own family what specif products meet your needs. Are any of your products “organic”? – We currently are using some organic spices and seasonings. Our Chicken Fajita Seasoning that we have as a limited edition mix will be available as a permanent item in our Fall lineup as one of our first ORGANIC mixes. – We do not ADD any preservatives to our mixes. However, some raw products or ingredients such as cheeses may have antioxidants to prevent spoiling. Where are these mixes made? – Our mixes are all handmade in Preston, ID in a commercial kitchen. We carry a Food Processing License by the state of Idaho. In addition, although not required all of our staff have food handlers permits. Anyone entering our kitchen area also must be wearing a hair net and gloves at all times. Why is there a large variance on shipping, sometimes I have my order in three days and sometimes it is a couple of weeks? – Due to the nature of our products and our commitment to provide you handmade fresh ingredients we do not store our products. Each one is made by hand to ensure quality and freshness. Think of this like choosing fast food or a family diner, one is quick and one is quality. We also have “complete” mixes and this means that they take additional time to make. As we continue to grow and add more staff members our shipping times also improve. Limited edition bundle on SALE this month only! – Cake Batter Fudge – White chocolate fudge that tastes just like cake batter! Add milk and butter, sprinkles included. – Watermelon White Chocolate Dessert –White chocolate chips in a watermelon blast! Just add whipped topping for a dessert dip or cream cheese and a graham cracker crust for an easy no bake cheese cake. – Tropical Chicken Salad Mix – Filled with coconut, macadamia nuts, pineapple & cranberry. Just add chicken and mayonnaise. – Chicken Fajita Seasoning – just add water and chicken, a flavorful sensation! – Raspberry Peach Scone Mix – similar to a biscuit these scones are fit for a king! Includes real raspberry and peach dices. Just add water and bake, don’t forget your jam. *Follow directions on package for cheese ball. Then roll the cheese ball batter into bite sized balls and roll in crushed graham crackers. What’s the difference between Cajun and Creole? The differences are subtle and few, but there is a definite distinction between the two. Simply put, Cajun is the food of the common people, Creole is somewhat more elevated in it’s preparation and presentation. Jambalaya is nothing if not a food of the people – simple to throw together, no advance skills necessary, and VERY tasty! 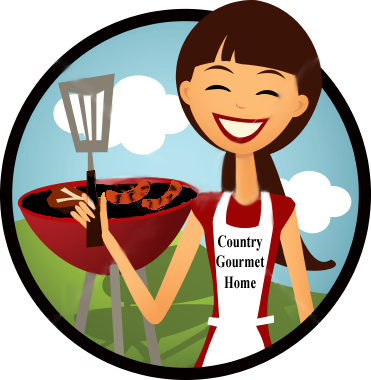 Today Country Gourmet Home is offering the Rajun Cajun Jambalaya as their “Deal Of The Day” product. Add some spice to life. Just add chicken and sausage for a taste of New Orleans most popular dish. Was $5.95 and is available today 7/8/12 for $3.99. Don’t you just love celebrating National Food Holidays? Today is National Peanut Butter Cookie Day! And yes, we have a mix for that! 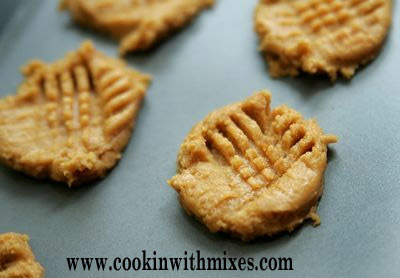 Our Peanut Butter cookie mix requires only water, that’s it, nothing else and the cookies come out of the oven warm, soft and delicious! I hope you enjoy this tasty day. In 1932, the Schenectady Gazette published the first peanut butter cookie recipe that called for crisscrossed fork marks on the top. Today, a peanut butter cookie just wouldn’t be quite right without this iconic decoration! To celebrate National Peanut Butter Cookie Day, head on over to Country Gourmet Home and place an order so that you will be able to make a batch of delicious homemade peanut butter cookies for your family! Today marks an important unofficial holiday, National Chocolate Chip Day! On this day, we pay homage to those delectable chocolate morsels that melt in your mouth (and sometimes in your hands), and all of the wonderful treats with chocolate chips that you might enjoy. 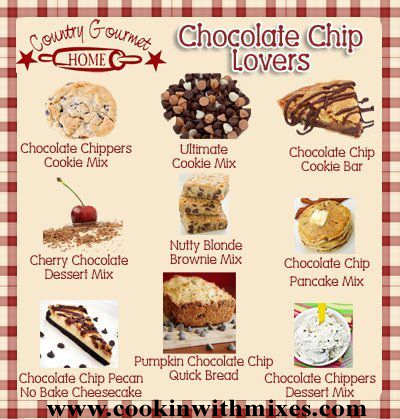 Country Gourmet Home has a wide variety of yummy mixes for the Chocolate Chip Lovers out there! Wishing everyone a very sweet day! I found this on the internet and had to share. Makes you chuckle. 21. My mother taught me about SHARING. 22. My mother taught me about FEAR. What did your mother teach you?? I love eating grilled food so I thought I would share a few tips that I came across on the web. the natural juices to escape and loose flavor and become chewy. 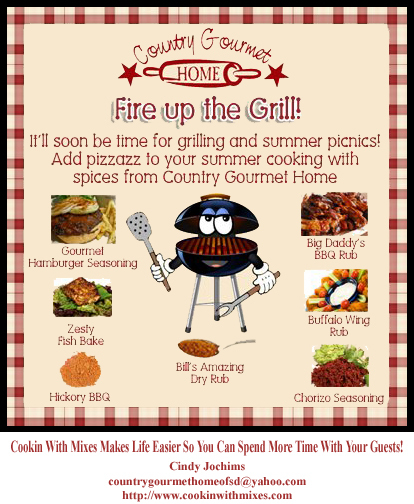 Country Gourmet Home has excellent products to make your grilling more tasty. What is your favorite grilled food?